Anyone that is paying any attention knows I have a thing for Gu Gu Sushi and Roll in Hermosa Beach. They have the freshest fish and the most unique rolls anywhere. They are all melt in your mouth good. Last week I went in and discovered they had named a roll after me. 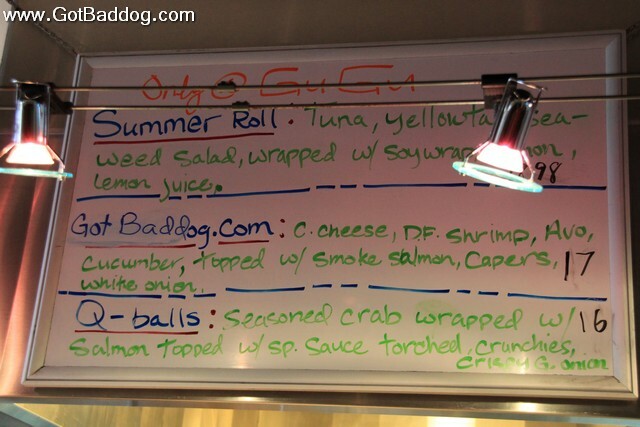 Today I came in and found that they had renamed the roll the gotbaddog.com roll. Talk about viral marketing! My picture of the day for day 215 is the menu at Gu Gu Sushi, advertising the gotbaddog.com roll. It is a very tasty roll.